Today is all about our favorite places to shop. I could go with the usual places that everyone loves - The World of Disney, The Emporium or Mouse Gear; but I'm going to go with a few of the places that I enjoy that sell some of my favorite kitchen and food items. In Downtown Disney one of my favorite places is Mickey's Pantry. You can pick up everything from kitchen items, cookbooks, wine and food. For kitchen items you can get everything from plates to bowls to coffee mugs (even those huge ones that you can fit two cups of coffee into). If I forget to pick up an item before hitting the airport, I can always make a stop here. The World Showcase is probably my favorite place to shop. I've picked up so many items from the different countries. Germany is one of my favorites to pick up food, wine and cookbooks. At Christmas time they carry Gluhwein, which is something that I love to drink during the holidays. 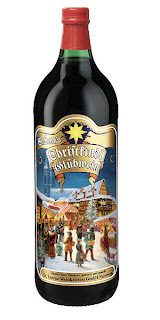 A dear friend of mine even picked up a bottle of it for me this year while she was down during the holidays. Another item I like to pick up in the World Showase is Asian dishes. For those I always hit is Japan. They have beautiful dishes and tea sets. 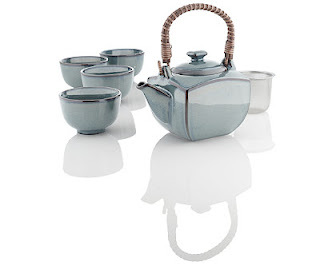 My current tea set actually came from there. I've even picked up some cute cat plates as well. I have found that they have a better and larger selection than the China Pavilion. There two other countries that I rarely miss picking anything up from, France and Italy. Typically in France I stop by and pick up some pastries from Boulangerie Patisserie to take home. They are great snacks whether traveling by car or plane. In Italy I have to get some wine and I have a few beautiful wine corks I've picked up over the years. I just wish that the wine was a good as what they sell in Italy but it's close enough. Great shopping tips. 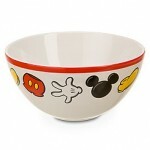 I love, love, love all the great Disney kitchen items that can be found. One of these days, I think I'll need to totally redo my kitchen! I love all of the kitchen items too! That store is a must stop for me! The dishes in Japan! The cat plates are adorable. I probably spend the most time window shopping at various World Showcase venues; but there is always a kitchen gadget that comes home every visit. great list of places to shop! I could spend hours in the world showcase shops!! i usually don't spend any money, but i love to look!